My sister told me about this a while back. I love asparagus and bacon, no matter how either one is cooked, so I knew I would like this. It is so easy to. It is probably not good for you AT ALL, but it IS gluten free. Just make sure the bacon you buy is gluten free. 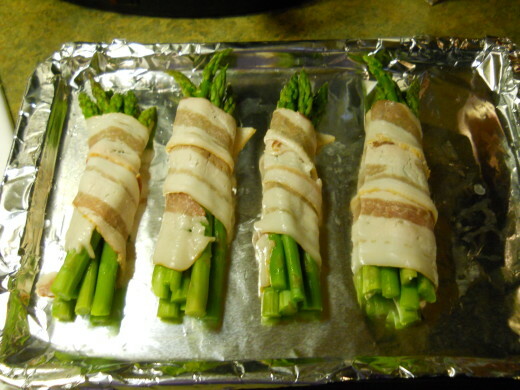 To make this, wrap a slice of bacon around five or six asparagus stalks. Line them up on an aluminum foil covered cookie sheet. Place the cookie sheet into a 350 degree oven for about twenty minutes, until bacon is golden brown. Yum! I am definitely going to try that. Ooh, this look so good! I haven’t had fresh asparagus in years and years, it was one of my Dad’s favorite veggies, I am going to try this as soon as I find some asparagus! 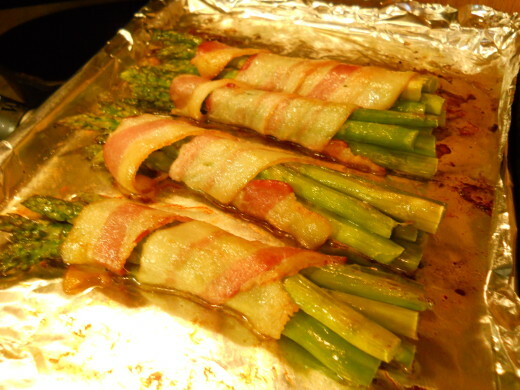 I love asparagus and never thought about wrapping it with bacon. This sounds so delicious. I will have to try it!